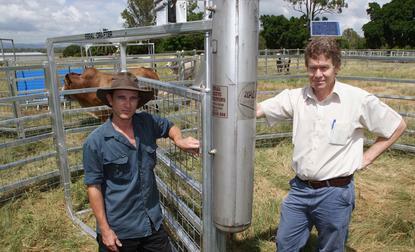 Neal Finch (left) and University of Queensland colleague Dr Peter Murray. Photo credit: The University of Queensland, photo by Chris Stacey. The idea behind the technology is keeping the artificial water basins on farms exclusively for domestic livestock, hence making more efficient use of the water that’s produced from rainfalls. Neal Finch, wildlife scientist and the creator of animal recognition technology, says currently only 10 per cent of rainfall ever gets used by farm animals and all across Australia farmers are calling out for help in controlling over-abundant macropod species, which includes our beloved emblem, the kangaroo. “People in the cities would probably find it hard to believe that kangaroos are pests, but there are research groups around Australia who have been working on ways to control kangaroos,” Finch said. The software Finch has developed is incorporated into a system of fences and gates which allows access to an enclosed area, such as a water hole. The animals are funnelled towards the gate by a “V” shaped fenced run, to encourage a single-file process. As each animal approaches the gate, a digital camera records an image of the animal against a blue screen and analyses its outline against a database to determine which exact species it is. The software works by analysing the videoed image of the animal frame by frame. It takes the outline of the shape of the animal and analyses it against the images stored in its database to determine the species of the animal. Once it has correctly identified the species the gate either remains open to direct them towards the water source or closes to deny access. “It all happens in real time, so it’s almost instant. The gate is always left in an open position and it will close when you want it to close,” Finch said. The system can distinguish between seven animal species including horses, cattle, sheep, goats, pigs, kangaroos and emus. But the software can potentially be adapted so other species can be added as templates. In the future this will help for distribution in other countries, in particular the US and UK. “We’ve had interest from the United States and the UK for controlling other species, things like contraceptives or vaccine delivery, where they have a need to only deliver a particular medicine or drug to one species but not other species,” Finch said. The software, which was written in Microsoft Visual Basic by CSIRO robotics expert Mark Dunn, will not be available as standalone software. It is currently going through the commercialisation process with Rural Pacific Marketing (RPM), and is expected to be available for farmers by the end of the year for around $10,000. Finch predicts the animal recognition technology to be 95 percent accurate upon completion of the commercialisation process. The software is loaded on to a Windows-based laptop and is powered by two 80 watt solar panels, and a webcam to recognise and split up the animals. Farmers can also have the option of a built-in RFID tag reader, allowing them to track exactly which of their animals are drinking the water. The third part of this series tomorrow looks into satellite farming.